From his dapper ties to his catchy slogan and his responsibility in a program taking a “giant leap forward”, P.J. 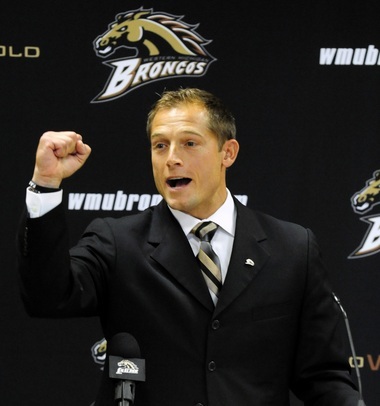 Fleck has become college football’s Don Draper. He’s selling winning at a program that’s never won before, but all of that is about to change. The only question is: how long will it be before a bigger program comes courting Coach Fleck? Random stat for this preview: Western Michigan was the number one team in the country at finishing drives last season. I know I was as shocked as you are. They also finished 5th in explosiveness, despite going against pretty much every en vogue offensive trend in football. The Broncos run a slow-paced ground it out game. They’ve just been blessed with an influx of superior talent (in comparison with their competition) and made the best of it. Jarvion Franklin is one of the best examples of this. Franklin came in as a true freshman and became the MAC player of the year. He rushed for 1,551 yards and 24 touchdowns, and is the only other running back in the MAC who can be put in the same class as Toledo’s Kareem Hunt. Franklin’s smooth blend of speed and power make him an ideal bell cow for this Bronco offense. If there is one concern though, it may be that his 300+ carries from last season are not sustainable. The Broncos have worked on that this offseason and have some talented backups like Jamauri Bogan in place to lighten Franklin’s load. Zach Terrell and the receivers should also play a substantial role in lowering the burden on Jarvion Franklin’s broad shoulders. Terrell made huge strides last year as he completed nearly 68% of his passes and threw for almost 3,500 yards. 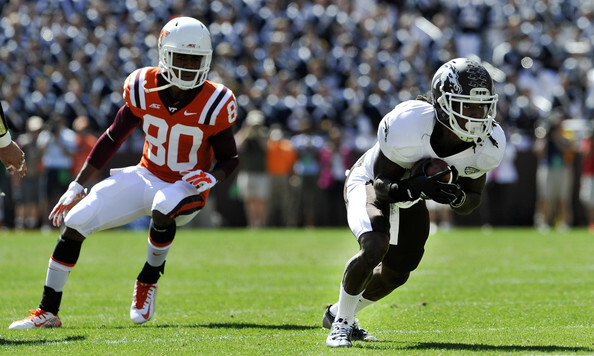 Of course it’s easy to be better as a passer when you are throwing to Corey Davis (fastest receiver in the MAC and potentially the top NFL prospect in the conference), Daniel Braverman (voted best hands in the MAC), and Darius Phillips (all-purpose player who received all-purpose nods as a return man). Add tight end Eric Boyden and a rash of talented incoming freshmen, and yeah, the Broncos are loaded at receiver. Having an embarrassment of riches at the skill positions is great, but it doesn’t mean anything if they can’t get to the open field (Chicago Bears and Atlanta Falcons fans sadly nod their heads). 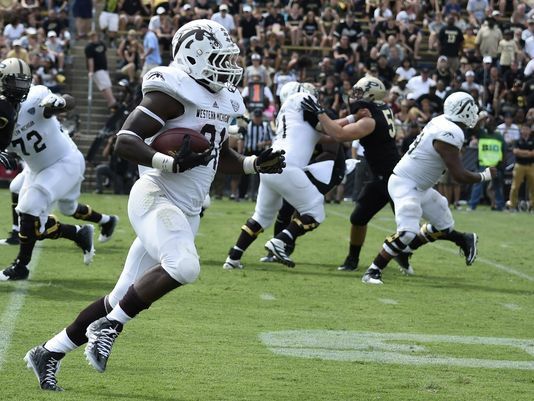 WMU shouldn’t have that problem with three two-year starters back including 2nd team All-MAC LT Willie Beavers. Western Michigan’s offense definitely makes it hard for the defense to get any recognition, but there are playmakers here too, especially in the secondary. SS Rontavious Atkins and CB Ronald Zamort make up a solid tandem on the back end. They combined for 26 pass breakups and 4 picks last season (all picks by Zamort). Donald Celiscar and Justin Currie will be tough to replace, but the Broncos have plenty of talented players ready to fill their shoes. Speed kills is a popular expression, and if you can’t have size up front then speed is a decent alternative. The Broncos at least need to bank on that, because there isn’t too much beef on the front end. However, Western Michigan’s defense thrived on creating havoc and disrupting plays both in the backfield and when the ball was in the air. If that is your end game, maybe speed is better than size. Jarrell McKinney, Andre Turner, and Cleveland Smith are all good pass rushers, but none of them tops 235 pounds. It would help the run defense if a heavier player like Nick Matich or David Curle could step up and see regular playing time. They will also lean on Grant DePalma to be a run stopper from his middle linebacker position. P.J. Fleck speaks to the crowd gathered in the ‘W’ Club after Western Michigan University Athletic Director Kathy Beauregard made the announcement of Fleck as the new Head Football Coach replacing Bill Cubit. This may be bold for a team who went 1-11 two years ago, but there is no reason to believe that it is unrealistic. Beating Michigan State and/or Ohio State is probably too tall of a task for this precocious team, but a MAC title is well within their reach. It won’t be easy though as the road still goes through MAC West staples like Toledo and Northern Illinois. The Broncos get both of those teams on the road, back-to-back to close out the season. It’s safe to say the MAC West will be determined in those two weeks.